Mihalik Hunor moved back from Canada to Hungary in 1998, then held the first Iaido practice in Budapest Főnix Kendo Club in 1999. At the age of 12, he saw a documentary that changed his life; he started to learn Kyokushin karate in 1970 at Orosháza, and engaged himself with martial arts for ever. In 1986, at the age of 18, he started to learn Kendo at Szeged, from Yamaji Manasori sensei. Two years later, he visited Japan, and get into acquaintance with Iaido. In 1988, he moved to Vancouver, Canada, where he learned Kendo from Asaoka sensei, and Eishin Ryu from Ken Maneker sensei till 1998, when he came back to Hungary. He continued his studies of Tosa Iai as one of the last foreign students of Iwata sensei. 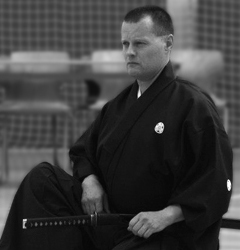 He has been the secretary general of the Hungarian Kendo, Iaido, and Jodo Association since 2002, also one of the members, and the leading coach of the Hungarian National Iaido Team since 2001. The Fighting Spirit was awarded him at the European Iaido Championships in 2001, 2003, and 2005. In 2007, he won the III. prize in the 5. dan category of the European Iaido Championships in Paris. In recent years, has been selected as a European Iaido Championship referee. He is an assistant coach of the Kendo section of the Hungarian – Japan Kendo Club besides Abe Tetsushi sensei. His current grades are renshi 7. dan Iaido (All Japan Kendo Federation-ZNKR) renshi 6. dan Kendo (European Kendo Federation). 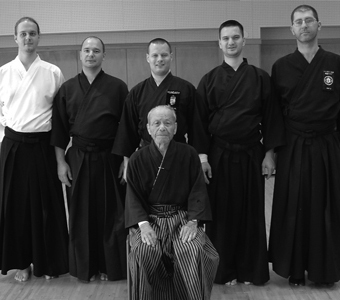 The basic task for EC is to learn, preserve, and hand on the MJER tradition learnt from Iwata sensei. Also EC members are responsible for developing MJER, organizing MJER events, and making popular authentic MJER iaido in Hungary.